I’ve got a new post running over at SC Johnson’s Family Economics full of Shrinky Dinks project inspiration. Today I shrunk my blog header into a thumb ring! I won’t even attempt to top this excellent shrink plastic ring tutorial on PlanetJune. For my ring, I just changed it up a bit by printing my blog banner to Shrinky Dinks® Ink-Jet Shrinkable Plastic. I could play with this stuff all day. And I just might. This entry was posted in Uncategorized and tagged diy jewelry, Family Economics, planetjune, SC Johnson, Shrink Plastic, Shrinky Dinks. Bookmark the permalink. Oh my goodness Kathe….your ideas make me swoon. This is wonderful. Wow! We played with shrinky-dink when I was a kid. 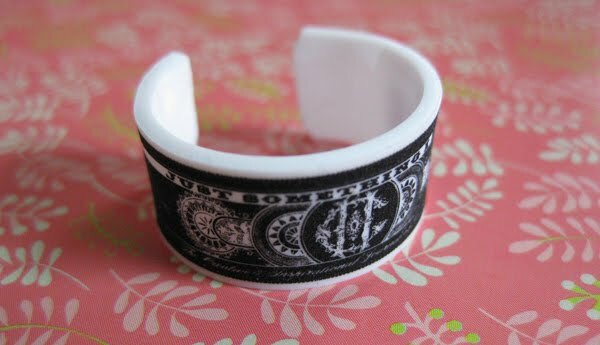 With bigger strips you could make your own personalized napkin rings. Check this link about antique napkin rings, I never thought about the reason for using them…. I love shrinky-dinks.. I have made all kinds of things using shrinky-dinks injet paper:) The inkjet kind is white..
What an awesome ring! That is a really neat idea, Cathe. How absolutly cool is this! Love that ring…Gotta have it! This one tips the clever meter my dear! Nice ring. I really love shrinky dinks. My favorite part is watching them shrink. Your ring looks great! Thanks for the tutorial, I will link to it over on CraftGossip! Hm? Another new idea I can check on trying! thanks so much for sharing your great ring with us! It is SO great! I love it! Thanks for linking to my tutorial, Cathe! I haven't tried making a ring with the inkjet shrinkydinks – every time I've tried using the printable kind it skews when it shrinks. I see you've had more luck with it though – your ring looks gorgeous! I love shrinky dink plastic – especially the ink jet type. Great ring! Hi Dolores, The rule of thumb is to make your image 3X the size of the final piece. However, that's not always perfect so it's a bit of trial and error. Hmmm… very cool. My hub lost his wedding ring while we were camping and this could be a really cool replacement until we can afford a new one! I just started getting into shrinky dinks. I have talked to a lot of people and they all “did them as a kid”. I never did them. don’t get me wrong I had great parents I guess they never got around to introducing me to them. haha. I fell in love with them. I have so much to learn and there seems to be so many ways you can do stuff with them. I had no idea you could make a hard curved bracelet like that out of shrinky dinks. Great Blog thank you. I love this! 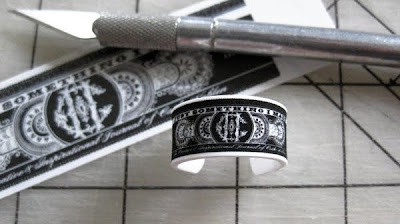 Would be a perfect way to make napkin rings for a wedding with a design that matched your invites w/yr monogram on it! Love it!